Arnhem, The Netherlands, November 29, 2018 – Teijin Aramid, leading manufacturer of premium aramid, has expanded its development support for customers of the defense and security industry. A completely new, first-class shooting range, based on the latest standards in technology and software, has been created in its Application Competence Center (ACC) close to the EMEA sales office in Wuppertal, Germany. This new state-of-the-art shooting range will allow customers to develop their new products designed to counter specific threats. For over 30 years, Teijin Aramid supports customers in the development of tailor-made solutions used in soft and hard ballistic applications for police, army, and VIP environments. Changing threats and individual demands are challenging development requirements. 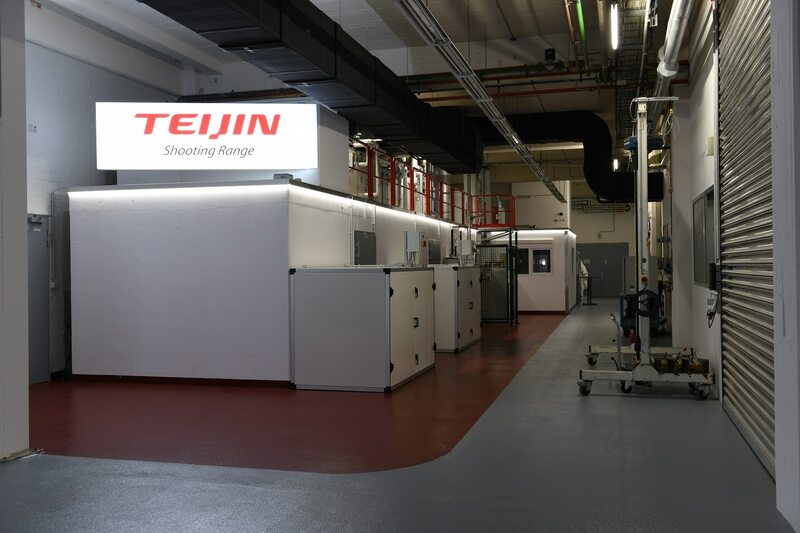 At the EMEA Application Competence Center (ACC), Teijin covers a wide range of testing standards for safety and defense applications. Their aramids Twaron®, Teijinconex®, Technora® and the ultra-high molecular weight polyethylene (UHMW-PE) Endumax® are tested in individual customer solutions and partly even with other products or components. The different tests and developments in the ACC take place in order to generate protective solutions against heat, open fire, cut, stab and ballistics. The ACC is a strategic location for development support and testing. Customers from all regions benefit from the long term experience in aramids and polyethylene, their converting and the broad offering of testing possibilities. Efficiency was one of the major drivers for this investment. A combination of work process optimization and implementation of new technology and testing software, turns the new shooting range into a first-class testing facility. The range length was increased to 17 meters and is compliant with various soft ballistic and hard ballistic testing standards, including helmet testing. This latest technology protects operators and the environment from ballistic threats, pollutions, etc. For the near future, additional enhancements are planned, e.g. a back face measurement performed via automatic scanning, providing information on depth and volume of deformation. Depending on market needs, an increased threat spectrum will be considered, as well as providing video streaming capability allowing customers around the world to witness ballistic testing live.